Would you take the opportunity? Trust your intuition? Let go of your fears and challenge your beliefs? Or would you let it pass you by, allow fear to overwhelm your thoughts – let your doubts consume every opportunity for true happiness, unconditional love and a new beginning? 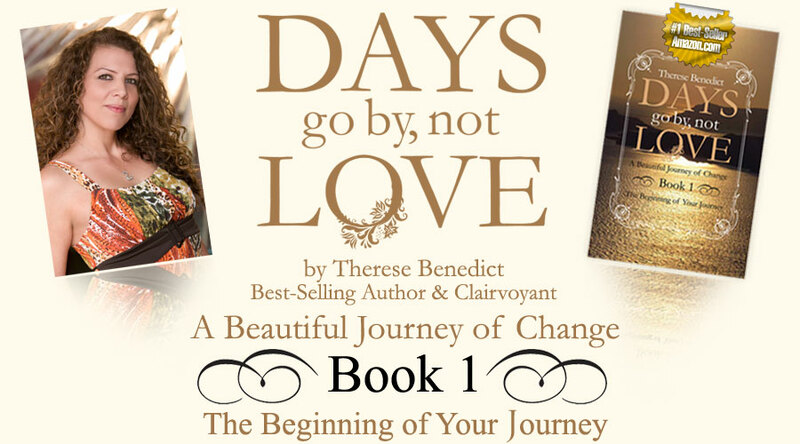 Days Go By, Not Love ~ A Beautiful Journey of Change is book one of a four-book series. It is the beginning steps to changing your life and to finding the answers to the questions you’ve long been seeking. In book one, you will learn how and where to begin with finding happiness. When you take your first steps you will begin to live with your soul and your heart’s true desires. And as your steps continue you will see many doors open for love to enter and learn where to close the doors of misery. You will see the brightness of light that you desire and feel it come from within your soul. You will understand how to take each step with love and strength – with more insight on the knowledge of deeper thoughts and understanding your actions and the actions of others; including learning how to change your actions and to help others to change theirs. "Days Go By, Not Love has literally shifted my world as I know it. As I practice the honesty it teaches; my relationships are changing right before my eyes and I am changing in my responses to everything around me. I have always thought of myself to be an honest person and yet this is a deeper level of honesty that I have not known before reading this book. It has given me a freedom I have searched for and could never quite find the key. Thank you, Therese and all your angels!" Internationally known best-selling author and co-founder of Chicken Soup for the Soul brings you an interview with Dr. Wayne Dyer. Focused solely on helping people from all walks of life reshape their vision of what's possible, no one is better respected in the area of human potential than Mark Victor Hansen. Aspire Magazine is the premiere inspirational magazine for women since 2005. Each beautiful, interactive digital issue brings readers inspiring and uplifting content from today’s leading visionaries, authors and columnists. Aspire is dedicated to inspiring women to live deeper, more authentic and inspired lives and brings you the tips, tools and resources to do so. Marie Benard is #1 spirituality and wellness radio show host. She interviews a wide variety of guests covering topics that are related to spirituality and wellness. Some topics include health, wellness, spirituality, meditation, yoga, homeopathy, naturopaths, mind, metaphysics, new-age spirituality, energy healing, the law of attraction, consciousness, self-awareness, God or Source or the Universe, psychics, angels, prayer and other metaphysical topics. Sallie Felton is a Professional Certified Coach (PCC) with a passion for helping others define their goals and create action plans to achieve them. In addition to her coaching practice, Sallie is an author, speaker and International Talk Radio Host. Her radio show A Fresh Start with Sallie Felton has been bringing consciousness-raising topics to listeners worldwide for more than four years. Dr. Joe Rubino, creator of The Self-Esteem System, and CEO of The Center Personal Reinvention, is an internationally acclaimed expert on elevating self-esteem, a life-changing personal development and success coach on how to restore self-esteem, achieve business success, maximize joy and fulfillment in life and dramatically increase productivity. Denise is an Internet Marketing Specialist having launched numerous authors to #1 Bestseller status on Amazon.com. She is also Senior Editor of the ezine, Long Story Short, Director of Curriculum and Production at the Long Story Short School of Writing and Publisher at Long Story Short Publishing Company. Personal growth expert and bestselling author Mike Robbins teaches you how to utilize the power of authenticity – leading to greater freedom and fulfillment in your life, relationships, and work. Joyce Shafer is a Life Coach, author of I Don’t Want to be Your Guru, but I Have Something to Say & other books/e-books, and publisher of a free weekly newsletter created to Encourage, Enlighten, and Empower. See Changing Course About Money Memories and more, and receive a free PDF of How to Have What You REALLY Want when you subscribe to State of Appreciation. Roberta, a dedicated alternative health care practitioner and licensed acupuncturist, is the founder of the Park Avenue Center for Wellbeing. She serves her local community of New York City as well as those who connect with her virtually online and through telephone coaching to improve their health. Jennifer Howard, Ph.D. is an internationally known licensed psychotherapist, Integrated Kabbalistic Healer®, Integrated Energy Healer, life coach, author and professional speaker. She is a co-founder of the Healing Path Center and maintains a private practice with offices in New York City and Huntington, L.I., New York, as well as an extensive phone practice. To those who want happiness without pain and sorrow. To those who want to see what the gift of life really means. To those who want to be loved right and to give love right themselves. Read these words and let time lead the way to freedom of misery. Eva Gregory is a master coach, conscious channel, speaker and author of several programs and books including The Feel Good Guide to Prosperity, 10 Weeks to Your Cosmic Connection to Source™ and Guidance On Demand: Where Spirituality and Practicality Merge™. Free Bonus Gift: How To Make Your Dreams A Reality Now! Considered one of the world's top manifestation mentors and a law of attraction icon, Anisa makes complicated Conscious Success principles accessible and easy to use. From her corporate position as CEO of a global, executive coaching firm with coaches on every continent, to her role as an author of dozens of Intentional Success programs to her cherished responsibility as wife and mother, Anisa's passion unites your life's passion with your work, attracting your dreams and fulfilling your purpose. Kathy Noll is Glamour Magazine’s Woman of the Year, and an author of the award-winning book, Taking the Bully by the Horns. She has won National Awards for helping schools, educators, parents and children "Empower Those in Need, Make the World a Better Place, and Save Children's Lives." Nadia Sahari is the Best-Selling Author of “Breakaway: How I Survived Abuse.” Nadia Sahari tells us the story of her life. Unfortunately, many of the events that she experienced in her early years were heart-wrenching because they involved sexual and physical abuse. She bares her soul to us as she describes horrific events that she experienced. As a best-selling author Alexandra’s take on success is that experiencing any level of it whether in business, wealth, career, relationships or weight loss you have to be happy first, otherwise it just doesn’t last. Dr. Bill R. Path is an Arkansas native and holds degrees in Bible, counseling, and higher education. He is currently the president of a community college in Norfolk, Nebraska where he enjoys coalition building activities and motivational speaking. He and his wife, Deb, have two adult sons, Grayson and Dalton. Adolphina Shephard is an Intuitive, Spiritual Teacher and Mentor, Etheric Surgeon, Researcher and Pioneer, and a gifted Metaphysician, who teaches a vast variety of techniques of Energy Medicine through the Modality of YATUVAY. She has helped many achieve wellness who had no hope left of regaining their health or experiencing happiness once again. She works with and is a conduit for The Holy Trinity in service to God. First published in 1987 Kindred Spirit is the ultimate global guide to positive change. Available bi-monthly each issue covers a range of diverse subjects such as spiritual growth, personal development, complementary therapies, travel, health and much more. Dr. Tianna Conte is a unique blend of mystic and scientist. Her childhood mystical roots led to a career that has spanned over 25 years as a trained Naturopath, Ordained Interfaith Minster and initiated Shaman. Her passion is in integrating ancient healing wisdom and cutting edge technologies in energy mastery. She is the director of Infinite Possibilities Productions, Co-Author of Love's Fire ~ Beyond Mortal Boundaries. Discover the Sacred Feminine within you and experience doorways to Divine intuition, psychic awareness and awakening. New Dream Foundation provides inspiring articles and guided meditations, where together we learn powerful, feminine ways of shedding our limited natures to become our limitless selves. I have been doubly fortunate – not only have I read Days Go By, Not Love, but I have also been able to work directly with Therese Benedict. Along my journey, which involved the ending of a 20+ year marriage, the book and Therese provided insights into how to best handle the situations that came up. The answers did not always present themselves when I wanted them to, in the manner I may have wanted, or along the timeline I tried to push. But, without ANY doubt, the answers always came and the outcomes were always beautiful. So beautiful, in fact, that the marriage dissolution has now been completed; more importantly, my former spouse is one of my best friends. An outcome I would not have thought possible at the start of this process. If you find yourself in a difficult situation, perhaps you feel you do not know where to turn in your life, or if you just cannot figure out why life is so difficult, then you are in the PERFECT space to read this book. It will turn your life around by turning your thinking and actions around. When you step through life speaking the truth and acting with love, then it can't help but have beautiful outcomes. We encourage that as you begin your beautiful journey of change that you share it with your family, friends and co-workers so that they may find their light in love and happiness for life once more. Please Note: Those ordering multiple copies, please email Therese@DaysGoByNotLove.com along with a copy of your Amazon order confirmation # and receipt of payment. You will be contacted by email to schedule your one-on-one private session. Dr. Karen Kan is a Law of Attraction Relationship Coach and Author: Creating Your Fairytale Love Life eBook. Dr. Karen is a holistic healer, originally trained in family medicine, and a medical acupuncturist. My current passion is teaching single people how to attract the love partner of their dreams by harnessing the law of attraction. Hazel Palache, certified coach, speaker and best selling author is the President of Your Stairway to Wealth. Additionally Hazel holds certifications as a master clinical hypnotherapist and NLP practitioner. Hazel has been in the field of personal and business development for over 25 years. She is an expert in teaching and empowering women entrepreneurs to claim ultimate wealth through mastering their mind-power and build their own business with energy and ease. Sally Shields is an author, speaker, and radio personality. Co-host of the exciting new BlogTalkRadio show, “Blurb!” Shields is a frequent contributor to various magazines, and has been featured in Star Magazine, Obvious, My Day, Girlfriendz, For the Bride and many others. Endorsed by Dr. Laura Schlessinger and Martha Stewart, she is a repeat guest on the nationally syndicated The Daily Buzz with her Wedding Showers #1 Amazon.com bestseller, THE DAUGHTER-IN-LAW RULES! Jennifer Longmore, Soul Journeys® Empowerment and Enlightenment Coach, is a leading expert on soul acceleration through the Akashic Records. She is an international healer, speaker, guest expert, contributing writer and founder of the Soul Journeys® School for Spiritual Studies. For more than 15 years, she has awakened thousands of clients, just like you, to their soul purpose, through high-level private sessions, group coaching programs and certification classes so that they can live their most spiritually and financially abundant path. Estra is a certified Law of Attraction Life Coach and Psych-K® facilitator. Known as America's Life Purpose Coach, it is her passion to help people get in touch with their highest passions and purpose to find more meaning, joy and abundance in their lives. She helps you clearly define what you want, identify and release limiting beliefs and move into inspired action to make your dreams a reality. She is also a co-host of Coach Cafe on Blogtalk Radio, the Law of Attraction place to meet! Jeff Maziarek is an author and inspirational speaker. His first book, Spirituality Simplified is an easy-to-understand and entertaining work that provides an ideal starting point for anyone with a sincere desire to pursue a path of personal and/or spiritual growth. Linda Graham is the author of Procrastinating? Train your brain to STOP! Linda is a practitioner of Neuro-Linguistic Programming, Time Line Visualization Technique, and hypnosis. Linda is a practitioner with the Canadian school of Hypnosis in Ottawa, Ontario and has been interested in health and wellness since her early years. Linda also has extensive management, sales, and marketing experience in the health and human resources arenas. Simple, Yet Powerful Techniques to Change the Way You Think and How Chronic Procrastination is Affecting Your Health! Marcelo Honores is healing sounds enthusiast who seeks to democratize this unknown technology to the world. His website offers 400+ therapies based on sounds (MP3) based on brainwave entrainment. Roni Lipstein is the founding angel and enLIGHTenment GuideLight [Spiritual Life Coach] of Sanctuaire Soul's Sanctuary, your physical and virtual Wisdom and Wellness Community Lounge. We exist to uplift, assist, empower and enLIGHTen ALL to fulfill their destiny & manifest their HIGHest HAPPYness in our eternal NOW. Liz Cosline is a certified Life Ownership Coach/Team Enhancer who has received several awards. Liz coaches people to go to the next level when the status quo is no longer enough. Work, home, fun – are integral parts in the balancing of life. Zeno was blessed with a rare opportunity and divine guidance to develop an original and effective interpretation of the Human Design System revelation she calls Zen Human Design. With your conscious participation and observation, you can heal and harmonize all relationships. The trick is to understand your part in how conditioning works. See what the Zen Human Design chart reveals. E.Dee Conrad is a healer, palmist and author of #1 best-selling book, A New Dawn Awaits. E.Dee’s writings focus on the evolution of human consciousness and what each of us can do to help humanity move to the next level of spiritual awakening. E.Dee spent nearly 20 years working in Asia and the Middle East before embarking on her current path. Namaste. Corporate Woo-Woo(tm) Michelle Skaletski-Boyd of Soul-Felt Words, Inc. is a Spiritual Teacher & Self Awareness Leader with a divine mission of helping others fully connect to their Higher Self in order to live in balance and on purpose. Described as free-spirited and deeply passionate about her work, Michelle’s captivating stories, analogies, and parables will help you become one with spiritual flow. What’s Your Frame of Mind? Hunt Henion writes for The Examiner on the national level, has a PhD in Religious Studies and has written four books, including his bestseller, Looking Seeing & Knowing. Michelle Galatoire, founder of Balance & Bloom Life Coaching empowers women to create a life of purpose and passion with her gentle yet powerful coaching style. With Michelle’s extensive training and experience, she blends Circle of Life Certification, Guiding Mindful Change Life Coach Certification and The Fertile Soul Retreats method to empower women to embark on a journey of self-discovery and self-expansion to live fuller, more authentic and joyful lives. Universal Messenger of Fabulousness, Dianna Sandora is an Amazon Bestselling co-author of Juicy, Joyful Life and founder of Fabulous U, a website and internet radio show designed to connect fabulous experts with guests to help them to reconnect with their "fabulousness." Tony Deblauwe, founder of HR4Change and has an extensive background working with individuals and corporations in the areas of organizational design, human resources management, leadership, and development. A certified coach, he received his Masters degree in Organizational Development and Human Resources from the University of San Francisco, and he has written articles for several trade publications including the Northern California Human Resources Association and CareerSource magazine. Kate Michels; Core Alignment Specialist, Trainer, Speaker, Best Selling Author, Coach of Coaches and an expert at assisting to live aligned in truth. Using parameters of respected schools of traditional counseling, mentoring and psychology in programs development clients proclaim miraculous results. With her five steps know what you want, ask, show up, keep your word, have a natural attitude of gratitude and manifest miracles. Featured Authors: Stephen R. Covey (Seven Habits of Highly Effective People), Dr. John Gray (Men from Mars, Women from Venus), and Les Brown (Power of Purpose). Laura van den Berg, M.A. Laura is a personal growth coach, specialized in self-knowledge. As a gift, she offers you a practical manual, designed especially for you, to shorten your learning curve. It contains exercises to identify your core values & hidden beliefs, understand how they shape your life, what's holding you back. What steps can you take to adjust the flow of your life? Nina Bagnall is the published author of Looking Good Feeling Great Ladies 50 and overand writer of eBooks pertaining to health and wellbeing. Owner of “Life is a Journey”, created to help, encourage, persuade and enlighten all who visit. Michael is a certified Residential Coach III with over 13 years’ experience teaching teen’s self-awareness, self-esteem, and self-reliance. He has over 35 years’ experience as a holistic health practitioner with a B.A in Sacred Healing and has been a certified Bowenwork Practitioner since 2005. Sharon Withers assists clients that are struggling with the side effects of their chemotherapy, have chronic pain, arthritis, Alzheimer's, insomnia & many other ailments through various healing modalities. She also provides private sessions, relaxation classes, and personal transformation seminars. Lynne is the publisher/Editor of a holistic E- monthly publication dedicated to an expanding awareness that will support the integration of the mind, body, emotions and soul. Articles, interviews, art, poetry and community news supporting all those seeking personal development and spiritual growth starting from the inside then expanding out. Actualize your spiritual consciousness and human potential, through personal wellness. You have a choice to be happy or unhappy; when you wish to be happy you need to take the steps to understand why the misery lies in your life. This book will bring sight to why certain situations of unhappiness are living in your life, and will also show you how to diminish the unhappiness – to open the doors to your dreams of living a life of peace and love." Anna Maria Prezio, Ph.D.is a Certified Feng Shui Consultant, Bestselling Author and Intuitive. She has studied with a multitude of feng shui masters and metaphysical gurus. She has devoted herself to helping others achieve optimum positive environmental energies. She has done this through hundreds of feng shui audits, readings and consultations on a local, national and international level. Barry’s book, Filling the Glass was cited as “[One of] The Seven Essential Popular Business Books” by Today’s Librarian magazine. His latest book, No Lie: Truth Is the Ultimate Sales Tool, from McGraw-Hill, has been translated around the world. His other books include The Prentice Hall Marketing Yearbook, the niche book, Getting the Most from Your Yellow Pages Advertising and the mini-cult classic novel, Legend. Carolyn Howard-Johnson is an award-winning author of fiction, poetry, and nonfiction. Her How To Do It Frugally series of books has helped writers and retailers worldwide. Catherine Behan, M.S. is a Relationship Expert, Seminar Leader and Internet Advice Columnist. She empowers women by teaching them to create a new relationship with themselves, to attract love rather than to chase after it and to enjoy romantic relationships with their men without compromising their souls. Doris has won awards for her books, speaking, and corporate training regarding elevating productivity, motivation, and happiness at work. Some of her books have been published in many foreign languages. Doris Helge’s “Joy on the Job” emerges from helping others discover more happiness at work, whether they are in their dream job or working a job they can’t wait to vacate. Dr. Holstein is a nationally known Positive Psychologist and Author. Her newest book, a national best seller on Amazon, for Being A Teen: The Truth (I'm a girl I'm smart and I know everything) is helping girls, tweens, teens and their moms nationwide communicate, enjoy and understand each other. Gerry Hopman is a Humorist, Humor Motivational Speaker and Author, who believes that humor and laughter are essential to finding and maintaining balance in life and career. Joyce Anthony’s education in both Psychology and Criminal Justice indicate the duality of her nature. As an author, reader and writer, dreamer and fighter her passions include working toward animal rights, a more effective children's mental health system and equality for all throughout this Earth she calls home. Nikki Leigh is a certified Love Coach that works with single and married, men and women to help them understand themselves better and to improve their most personal relationships. At an early age, Rick realized that he had the unique ability to relay messages from those who have passed. Rick Hayes is the founder of LifesGift, Inc. - an association that supports his consultation and speaking engagement services. As a Consultant with unique abilities, Rick consults on a daily basis with those that have questions regarding life and life-after. Tal Shai, the founder of BigDreamGuru.com, is an Author, Speaker and Intuitive Prosperity Coach who provides savvy and spiritual solutions for women all over the planet to 'Live Their Soul's Purpose & Prosper™. Therese Benedict is a clairvoyant with an undeniable gift, which allows an authentic and direct communication with God and his angels. Throughout every moment of her life, Therese works endlessly with the angelic realm to bring love, peace, and healing of past and present to help change your wrong actions to right by giving you the knowledge of the wrong and giving you the answers to the right. Therese communicates with God and his angels through many divine channels including seeing, speaking, hearing and through physical and spiritual healing. Her book was written from the loving words of God to help people learn how to think about their actions in their life with bringing insight of the hurt that is being caused which is unknown to them. Days Go By, Not Love will give you the steps to start changing your life to love and to forgive yourself of your past and present actions, to help you change those actions to beauty. Therese was presented the Congressman’s Medal of Merit by Congressmen Steven Schiff for helping the community of Albuquerque, New Mexico. Having survived and healed from Melanoma Cancer, Therese continues on her mission of healing the world through her knowledge, teachings, writings and guidance to help change your life and the lives of millions. Days Go By, Not Love is the beginning steps with your changing life…With three additional books to follow, it’s the inception of a journey to help people understand how to change and what to do to succeed in their change. It’s straightforward in speaking of the challenges and obstacles when facing one’s past and to change to become who they were intended to be. Its words resonate with the spiritually minded, but can help all walks of life to change…This book speaks through one universal language: Love. So love you every day and let the Days Go By, Not Love. Purchase Days Go By, Not Love ... From Amazon TODAY! Alicia Isaacs writes practical life-changing inspirational thoughts, insights, steps and tips gleaned from personal experience and observation. LAWRENCE J. KING the author of a book called What The Hell Were You Thinking? It is a collection of key life experiences and reflections from his reinvention from being incarcerated to Head Chef, Buddhist, and caregiver with an emphasis on a Buddhist approach to life. Mr. King is a U.S. Army Veteran who lived in Europe from 1979 - 1994. During those years he was a martial arts instructor teaching Tae Kwon Do, the Korean style of self defense to the men and women of the armed forces. Schall Adams is an author, speaker, powerhouse singer and talk radio host. Schall is a co-author of two motivational books, Power of the Platform, Speakers on Life with such experts as Jack Canfield (creator of Chicken Soup for The Soul), Brian Tracy, Les Brown and Arielle Ford, and Mom Entrepreneur Extraordinaire. Schall speaks of the importance of discovering your true purpose in life and expressing your gifts. Kathryn Ross is a social media guru and enthusiast. She will build your Twitter following with targeted followers and send them a direct message each time they follow back. You'll see your list grow and drive traffic to your website, book or products. Misa Hopkins is the author of the best-selling book, “The Root of All Healing: 7 Steps to Healing Anything.” Her observations about the healing progress of her clients and her own miraculous healings led to ground-breaking conclusions about why people remain ill and why they become well. Schwarz is probably best known as the consultant who organized the famous MISSING KIDS ON THE MILK CARTON CAMPAIGN for Ralph's Grocery stores nationwide. She is also a known Hollywood career strategist and the author of 6 books including her #1 Best-Seller THE VISION BOARD: The Secret To An Extraordinary Life. Sylvia is a free spirit, in love with Life. She got her call at an early age and learned that we commune with the Divine through our conscious communion with Nature. At age thirty-two, she had a Near Death Experience during which she agreed to become a Walk-In and help set the stage for the emergence of the divine Human. DaKara Kies is a gifted intuitive healer that specializes in clearing core issues and blocks that hold you back from stepping into your true power, passion and purpose. Working with the inner child to bless, heal and nurture that most sacred part of ourselves. Christy Whitman is an in-demand life coach, and motivational speaker. She is also CEO and founder of the Quantum Success Coaching AcademyTM. Christy has helped thousands of women and men around the world achieve their goals through her empowerment seminars, speeches, coaching sessions and products. Christy’s has been quoted in Seventeen, Woman’s World, Woman’s Day, Teen Vogue, The Star Ledger, and Knot Magazine. Darren has been speaking, coaching, teaching and researching the topic of “letting go” since 1994. He is delighted to share this eBook full of inspirational quotes about Letting Go & Simplifying Your Life. “It takes courage, tenacity, a fearless attitude, and love of oneself to truly change one’s life and begin moving in a completely different direction toward a new vision." Jennifer Urezzio developed Know Soul’s Language to help people understand their own innate insight and voice. She is an expert at using intuitive abilities in everyday life to help people achieve their goals. Do you want to know more about your future, and what’s in store for you next? Are you wondering what your reoccurring dreams mean and the messages that are behind them? Do you wish to communicate with a loved one who has passed? Have you been struggling with overcoming your fears or an addiction? Do you wish to change your life, but don’t know which steps to take? Are you suffering from loneliness, heartache, depression, lack of hope, longing for love? Get ready for a spiritually uplifting and inspirational journey as Author & Clairvoyant, Therese Benedict, will help you heal from your past and love who you are while showing you the steps to take to finding true happiness. Christine Ranck, Phd is co-author of the consciousness-expanding creativity book, Ignite the Genius Within. She is also a psychotherapist, singer and sought-after corporate motivational speaker and seminar leader on the optic of freeing creativity for a wide range of organizations. In addition, she is a self-defense trainer and vocal advocate of self-defense training for women. She is a part of select volunteers who give daily educational tours of Ground Zero as a part of Tribute NYC. Sue Urda, a.k.a. the Connections Expert, is a speaker, author, and inspirer. She is Co-Founder of Powerful You! Women’s Network, a two-time honoree on Inc. Magazine’s list of the 500 Fastest-Growing Private Companies, and author of Powerful Intentions ~ Everyday Gratitude and Empowering Transformations for Women. Sue’s personal mission is to motivate to assist individuals in their own pursuit of success, joyful-living and balance. As a Certified Senior Advisor, and living trust and estate planning expert, Kris Miller helps people of all ages plan for their retirement with complete estate packages – including newlyweds, GenXers, the Sandwich Generation, Baby Boomers, and retirees. Kris recently published her first book on the topic: Ready For PREtirement? Everything you Need to Know NOW So Your Money Is There When You Need It. Host of the hot, new radio show, Opening to Ecstasy ™, best-selling author, transformational healer and coach, Lynnet McKenzie teaches ecstasy as a way of BEING. After experiencing sexual and physical abuse, debilitating injuries, chronic illness, anxiety, and depression, Lynnet learned to Open to Ecstasy in any and all circumstances. She now offers radical healing and straight to the core coaching to help women get off the treadmill of suffering and into a life they LOVE. This toolkit will get you started. 10 Ways To Go From Frazzled To Fantastic In 5 Minutes! Dr. Richard Ragle was a board certified Family Practice physician and sub-specialized in Addictionology. He was the medical director at Careunit of Albuquerque and assistant director at Cottonwood de Albuquerque. Taught Family Practice, Addictionology, medical detox, and diagnosis and treatment of child abuse at Western University of Health Sciences in Pomona, CA. and at University of New Mexico Hospital in Albuquerque. Susun Weed, herbalist and women's health expert, is an extraordinary teacher with a joyous spirit, a powerful presence, and an encyclopedic knowledge of herbs and health. She is the voice of the Wise Woman Way, where common weeds, simple ceremony, and compassionate listening support and nourish health/wholeness/holiness. She has opened hearts to the magic and medicine of the green nations for three decades. Tambra Harck is a speaker and spiritual mentor, guiding visionary women through soul-level transformation so that they experience more joy, wealth and love in their lives. Dawn Allen is a Love & Prosperity Expert and author of the forthcoming book, Meet And Marry Mr. Right, 7 Steps to Magically Magnetize the Man of Your Dreams (The Feminine Process to Finally Finding & Keeping the Right Man Once & For All). Elizabeth Bennett received her M.Ed in Guidance and Counseling Services and also has a background in Psychology. Since 1995 she has worked on the problem of Peer Abuse through observational research and theory development. She speaks to both children and adults on this topic throughout the nation. Currently, she is certified through the Olweus Bullying Prevention Program. Carl is a modern-day spiritual pioneer who had a profound transformative event that changed the way he viewed his life and the lives of all of us forever. Since that life-changing event, he has devoted his life to sharing this “knowing” with those who search for a similar awareness. His fundamental aim is that we realize our own divine nature. Floriana is the author and editor of ten nonfiction inspirational books. She is also the founder/coordinator of the Poet’s Nook at Cuyahoga Falls Library, Editor of The Poet’s Nook’s three books, THROUGH OUR EYES, POEMS OF BEAUTIFUL NORTHEAST OHIO, POET’S NOOK POTPOURRI, and TOUCHING THE HEARTS OF GENERATIONS. She is published in United States, England, France and India and a winner of many poetry contests. Betty is the author of a number of books including Family Lines which combines articles on the logistics of researching your family history with essays on some of the author's more interesting ancestors. Therese's writings are to bring others peace and to help them through life's hardships, so they may have a better life. Her writings are of love and passion for all people. Therese cares of the pain and hurt that people go through. And she knows there is a way out of that pain that they do not wish to carry any longer or let destroy their lives. Not only does this book help people heal but it will help them change what they always wanted to conquer within themselves. In her book, Therese helps to change people’s lives with insight of thoughts they have not yet achieved. Days Go By, Not Love is a book to help people change their lives and find their dreams. Lisa is offering her ebook "Using Stories to Get Great Clients" and a transformational "Business Breakthrough" Story Coaching Session ($300 Value) where you'll uncover the challenges that are jeopardizing your business success, de-stress your marketing and leave the session re-energized to make your business highly profitable. You'll move from anxiety to authenticity, from stress to simplicity. It IS personal and it's all about the story you tell! Jackie Lapin is a writer, speaker and visionary educating and uniting the planet’s people to manifest a better, healthier more peaceful and joyful world. She is revealing to humanity its ultimate power for global transformation and leading the call for synchronizing a vision for a new and better reality. Author of The Art of Conscious Creation. Thomas Troward is arguably the most important writer in New Thought History. He has influenced countless other writers because his insight is so clear and informed with compassion. Troward's work has had a profound affect in the field of metaphysics, in particular that of the New Thought Movement. Laura Lester Fournier is a best selling author, motivational speaker, non-denominational minister and radio host. She is the internationally known author of a series of spoken word CD's on cultivating the energies of peace, forgiveness, true love, and grace. She has just released her fifth book, "The Caterpillar's Flight - A Story Of Transformation - Spirituality For Real Life." She is the founder of The Center of Forgiveness in Rollinsford, New Hampshire. Michelle Bersell, M.A., M.Ed. is known as a visionary leader in emotional consciousness whose advice has been featured nationally because she challenges common thought regarding feelings. Combining her training as a psychotherapist along with her spiritual insight, Michelle continues to lead thousands to a new level of accessing and celebrating their potential. Marcus Dino...is a die hard movie buff and has written and published 2 books: Fifi Anything Goes in the Double Os and Diary of a Mad Gen Yer (ebook). Mr. Dino currently teaches math at a Los Angeles middle school, before that he worked as an engineer in the Aerospace Industry. Carolyn Daitch, Ph.D. is an internationally renowned clinician, trainer, author, and presenter. Dr. Daitch is the director of the Center for the Treatment of Anxiety Disorders in Farmington Hills, Michigan. She is a certified and approved consultant and fellow with the American Society of Clinical Hypnosis and a certified Imago therapist. Her time is split between clinical practice, supervision, consultation and teaching. She routinely gives training and presents to practitioners in the United States and abroad. Peter J. Fogel is one of America's funniest comedians that you’ve never heard of... but have seen countless times on television. From comedy clubs, to cruise ships and Las Vegas theaters, he’s opened for such stars as Rita Rudner, Jimmy "J.J" Walker and Robert Wuhl (HBO's Arliss). Release your stress, fears and worries of the world… Relax your mind, body and soul as you surrender your thoughts and transform your energy into the peaceful serenity of love. Close your eyes, open your heart, and let your mind wander through these melodic mediation sound tracks. *Please Note: These FREE Bonus Gifts are not in any way associated with, nor deliverable by Amazon.com they are delivered electronically over the Internet from this Web site or from an affiliate Web site. You will immediately be able to download them once you have purchased the paperback version of Days Go By, Not Love from Amazon. Once you have made the purchase from Amazon, simply return to this page enter in your First/Last Name, Email Address, Amazon order confirmation #, ZIP Code and begin downloading your FREE Bonus Gifts. That's it, it’s that simple. Enjoy! Copyright © 2011 by Therese Benedict, All Rights Reserved.